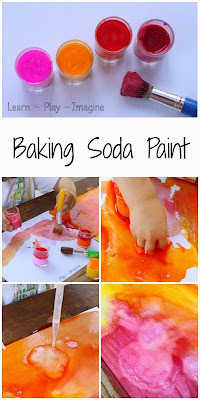 Baking soda and vinegar color surprise eruptions, a twist on a childhood favorite. I think it's safe to say that all kids like making eruptions. I know mine do. We have made eruptions with Kool Aid and paint, color mixing eruptions, vinegar free eruptions, giant soapy eruptions, ABC eruptions, and eruptions with apple sidewalk chalk paint. It doesn't matter how many times or how many different ways I set up an invitation, erupting activities are always a huge hit. While my boys enjoy the classic baking soda and vinegar trick I like to put a spin on it now and then. 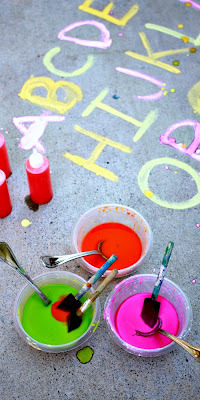 I thought it would be fun to create color surprise eruptions. Directions: The set up was SO simple for this. I love simple activities! I put one large color tab into three of the containers. The tabs come in red, blue and yellow. 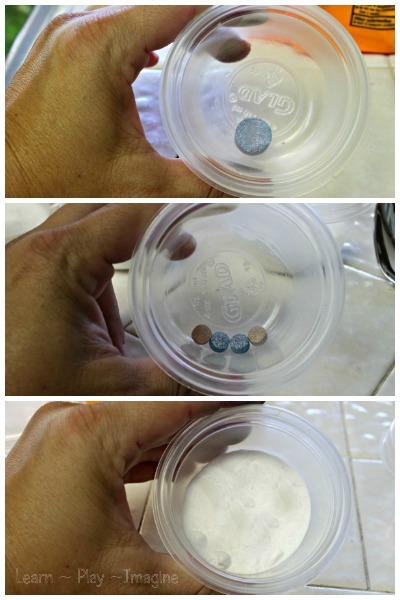 To create other colors I put two small tabs of two different colors in the remaining containers. Then I covered the color tabs with a spoonful of baking soda. A little baking soda really goes a long way. If you don't have color tabs, food coloring or liquid watercolors can easily be substituted. 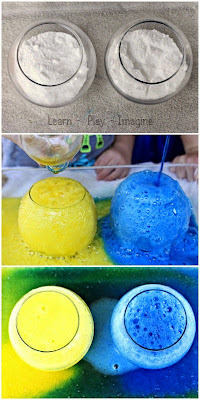 I filled up the squeezy bottles with vinegar and set up an invitation to create eruptions. Peanut (26 months) saw me carrying the containers outside to the toddler table, and he threw down the trains he was playing with and chased me outside. He didn't need any instructions. He immediately started squirting the vinegar into the containers. He said ooh and ahh and continued to squirt, asking me to fill up the bottles each time they ran out. As you can see, the eruptions spilled over onto the table. If we were playing inside or in cooler weather I would have put a dish under the containers to hold all the overflow. I thought the colors looked beautiful as they mixed on the table. After squirting the vinegar and making the baking soda overflow again and again (like I mentioned a little goes a long way) Peanut started mixing the liquids to make even more colors. 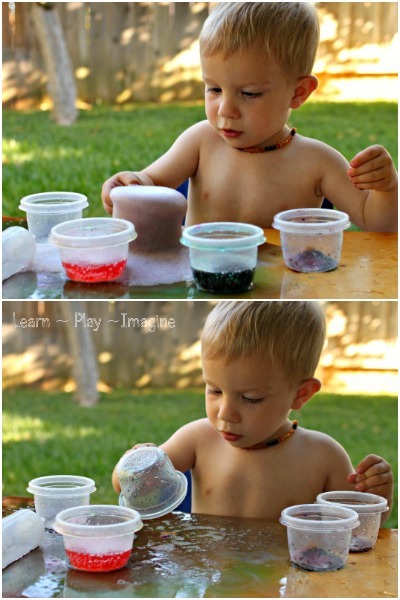 Then he dumped the containers out and ran his hands through the colorful mixtures. 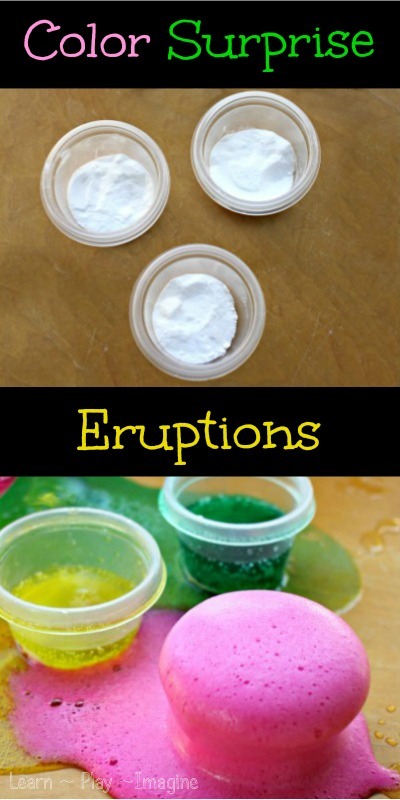 For more cool eruptions for kids follow me on Pinterest. How cool does this look! Just pinned. Mixing baking soda with Kool Aid makes for a similar activity. The powdered mixtures that result are pastel coloured but brighten right up when vinegar is added. It smells amazing.